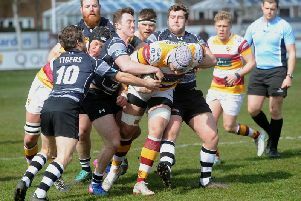 Fylde RFC head coach Warren Spragg warns it will be like facing a champion team when a fully fired-up Loughborough Students team arrive at the Woodlands on Saturday fighting for their lives. While this will be relegated Fylde’s last home game in National One for at least 15 months, the third-bottom Students could still survive with two matches remaining. But Spragg is no less determined to end his side’s 15-game losing run and told The Gazette: “Loughborough will do everything they can to strengthen for Saturday. They will have their dual-registered Leicester Tigers players and it will be like facing Coventry. Spragg maintains Fylde’s miserable season could have turned out differently and he points to a key period in the closing weeks of 2017. “Had those results gone our way we’d have had a fighting chance but that’s where the season turned. “One issue is the age of the players – when young players are on the receiving end of some defeats they get into habits it is difficult to get out of, and we got to the point where it was hard to believe we could turn games around that were going against us. James Bailey and Dave Fairbrother are unlikely to feature again this season, while several Fylde players are involved in a North Under-20 trial on Sunday. Eight have been named in a 44-man Lancashire squad which will launch its defence of the County Championship at Northumberland on May 5. The Woodlands will stage the final group game against Cheshire on March 19. The Ben Trend Memorial Walk from Blackpool RUFC to Fylde takes place on Saturday, with the walkers due at the Woodlands at around 1pm. The bentrendgetinvolved charity helps Fylde coast sport and donations are welcome at justgiving.com/fundraising/bentrendmemorialwalk2018.